First birthday cake smash sessions our one Neal Urban Studios favorite type of photo shoot. They are so fun and we never know what is going to happen. Chase came in for his first birthday portraits. He was having a Mickey Mouse themed birthday party, so mom and dad had a Mickey outfit they wanted to use. We started with family portraits with mom and dad. We actually had the pleasure of photographing the parents wedding a few years earlier. The ceremony was at Prince of Peace Church in Niagara Falls. The reception was at Antonio's Banquet and Conference Center in Niagara Falls. We had such a great shoot with this little guy. Mom decided to do red frosting for his cake. It was such a cute cake. Little did she know, red frosting is a disaster waiting to happen. A good one though! Red stains the skin. 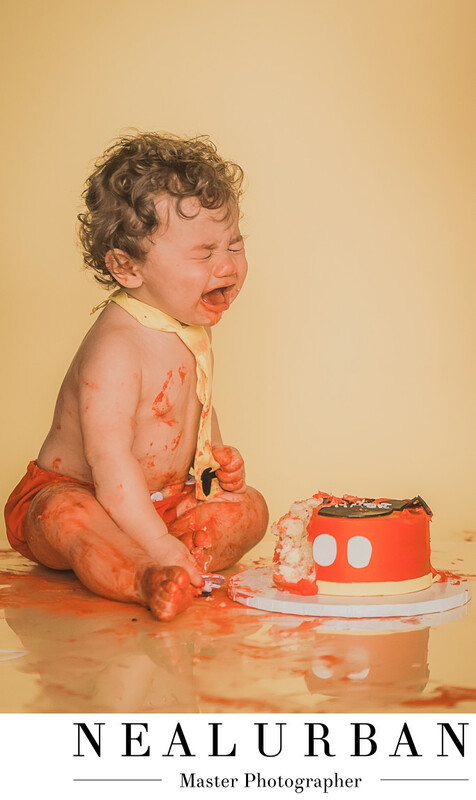 In this image you can see this little boy is covered in red cake frosting. It was everywhere. He did an amazing job destroying his first birthday cake. We don't think any when into his mouth, but it was great! You could tell he was starting to get tired and was done. Mom stepped in to see if she could get him to eat the cake. Her son climbed up her leg, red frosting and all. Covered her jeans. Later that day mom messaged me and said her jeans were ruined and now considered lay outside jeans. When Chase started to cry, we kept shooting. He looked too cute. When going through all of the images, this was our favorite. This was the first image we put up on our blog and on face book. We could not resist. Mom and dad loved it. He had the cutest curly hair. This is why we love cake smashes. They are so much fun. Everyone is laughing and having a great time. We love doing this in Neal Urban Studio as well. We can create sets to match the theme of the party!